My tomato plants are growing tall and bushy, but they do face some problems. This weekend I noticed an outbreak of Blossom End Rot. Basically, the green fruit decays from the point where the flower used to me. I still have a lot of green healthy tomatoes on the vine quickly moving to read. I may be able to make a sauce this weekend. Or at least a mighty tasty sandwich. But I did lose a few. Some preliminary research taught me that this is likely caused by a lack of Calcium. For some reason, the roots can't pull up enough. That could be due to poor soil, too much water, or too much drying out. The first step was to pull the bad fruit. Then I added some fertilizer sticks to the soil and gave them a good soaking. While I'm out of town, the GF will water them (she does good work) and hopefully, I'll be drowning in deep red fruit in a matter of weeks. Garden news isn't always good. But those occasional setbacks make the fresh food all the more delicious. You can see more of my garden pictures here. 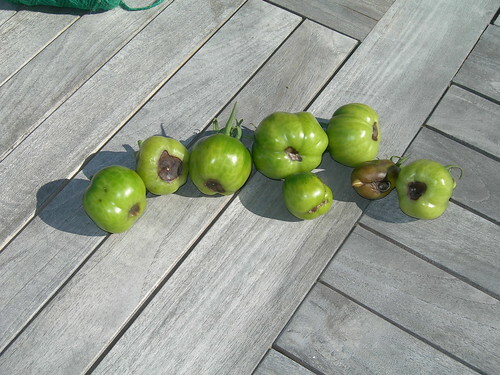 Sorry some of your tomaters got rotten. But it sounds like you got to it just in time! Sorry to see you have blossom end rot :( You took the right steps to correct it. 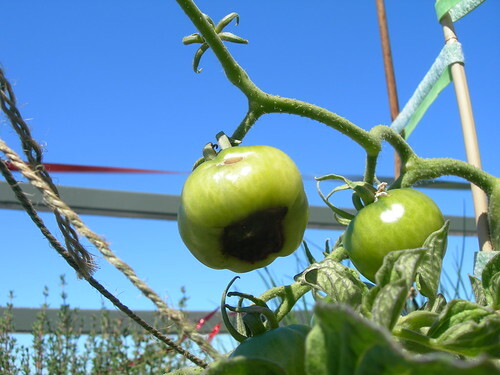 Your tomato plants will thank you with award winning tomatoes if you add epsom salt around the base of the plants. There's more information on epsom salt on my blog if you are interested. It is a must for growing great peppers as well but other plants will perform better with the addition of epsom salt too. I'm just browsing through your lovely garden pictures. Great looking garden! Interesting. I never knew foods could lack calcium like that. Good luck on your garden. Indeed, garden news isn't always good and just as life isn't always good. But the setbacks in life definitely will make us stronger when we learn from them. @Daisy: Yup. A few still show up like that, but the problem has stayed under control so I'm happy about that. @Garden Gnome Wanderings: I'll have to experiments with the epsom salts. I though about Peppers this yea, but despite a few toasty week, I don't think we usually get warm enough weather for them. Thanks for the picture comments. Taking pictures is half the fun. @Stacie: Me neither. But I guess is makes sense. I suppose it's one of those details I skimmed. @BK: True enough. The good stuff is never easy.